Eating is as important a part of camping as the camping itself. Getting out in the fresh air, enjoying fresh cooked food and stay well-supplied with nutrients and energy to last out the trip is all important. That’s why you need a good mess kit to be able to enjoy that food without too much fuss. Without a good mess kit, a camping trip gets a lot less convenient. So, we’re going to look at three of the best kits on the market. Largely, the best mess kit for you is determined entirely by your needs. We’re going to look at the kits and figure out who they’re best for, as well as the best overall. This means looking at what’s included, whether it has utensils and cookware alongside tableware, what and unique pieces each set has. But we also have to look at the durability of the pieces included and how long they’re going to last. Are they going to last one night, one camping trip or can you use them again and again? How well built are they? It doesn’t matter what a set contains if it’s not going to last the trip, after all. First, we’re going to look at this kit from IGoPeaks, designed for two people with 16 different pieces. 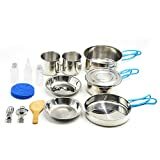 Those pieces are as follows: one large nonstick pot, a small nonstick pot, a pot cover, a nonstick frying pan, 2 cups, 2 dishes, a folding soup spoon, a folding fork, 1 oil bottle, 2 cruets, a wooden spoon, a cleaning sponge, and a Nylon drawstring travel pouch. Altogether, it weighs 1.7 lbs and it takes up 3.58’’ x 6.5’’ in space. All metal pieces are made of stainless steel and it all collapses into a neat package for easy travel. As such, it sets the price midpoint for the three we’re reviewing. The small size and easy packing makes this kit supremely compact and easy to move on the go. The IGoPeaks is a perfectly fine set that’s let down by a few issues. In particular, the small size of it may make it supremely easy to transport, but it also makes it much harder to make a substantial meal out of. For that reason, it’s a good option for youth campers, but perhaps not the best for grown adults. 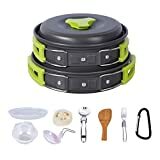 The Dynamic Gear kit is slightly pricier, costing only a little more than the IGoPeaks kit. 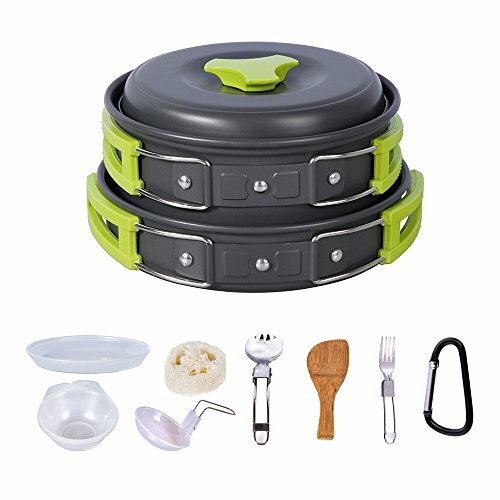 For that price, you get a nonstick pot, a pot cover, a nonstick pan, two green plastic bowls, two stainless steel sporks, a soup spoon, a wooden spatula, a cleaning microfiber cloth, a travel bag, and a camping stove. The stove makes a big difference compared to the IGoPeaks kit. You might expect it to be heavier, but it weighs 1.74lbs, only 0.04lbs more. On the other hand, it takes up 9.25 x 3.74 in space so it is a good deal bigger. Fixing a lot of the problems in the IGoPeaks set, the Dynamic Gear mess kit, while it does have one of its own: it’s not as easy to carry. However, the added value of not only the stove but the microfiber cloth which makes everything much easier to clean means it’s seriously convenient. For the minimal price increase over the IGoPeaks, the difference in value is immediately noticeable. With many of the same strengths of the competitors, but lacking many of their advantages and having a few weaknesses of its own, the HUKOER mess kit isn’t a great competitor. However, it is cheap, and might make a great first mess kit for those trying out a shorter trip. Just pack your own utensils. 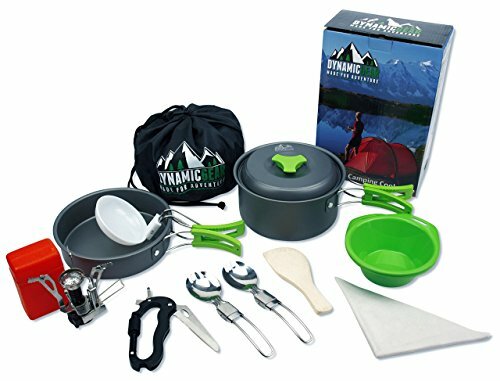 The camping mess kit we most readily recommend is the Dynamic Gear pack. For the slight price increase over the others, getting a stove alongside your kit is well worth it. The microfiber cloth is also a nice addition for making cleaning up a much quicker and smoother process, too. The Dynamic Gear might not have the strength of the stainless-steel IGoPeaks kit, but this option is too small for most campers and best suited to juniors. Lastly the HUKOER kit is a good purchase in its own right given the lightness, but with only a small price increase over it the Dynamic Gear mess kit is easy to recommend over it.